Vulnerability-Lab Team discovered a Memory & Pointer Corruption Vulnerability on Kaspersky Internet Security 2011/2012 & Kaspersky Anti-Virus 2011/2012. 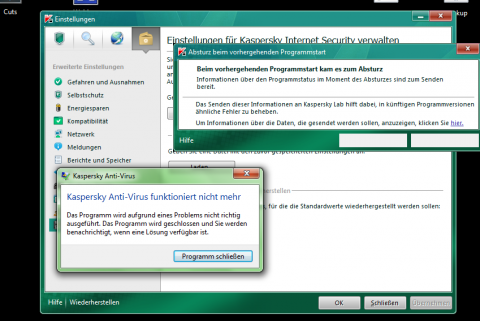 A Memory Corruption vulnerability is detected on Kaspersky Internet Security 2011/2012 & Kaspersky Anti-Virus 2011/2012. The vulnerability is caused by an invalid pointer corruption when processing a corrupt .cfg file through the kaspersky exception filters,which could be exploited by attackers to crash he complete software process. The bug is located over the basegui.ppl & basegui.dll when processing a .cfg file import. The kaspersky .cfg file import exception-handling filters wrong or manipulated file imports like one this first test ... (wrong-way.png). The PoC is not affected by the import exception-handling & get through without any problems. A invalid pointer write & read allows an local attacker to crash the software via memory corruption. The technic & software to detect the bug in the binary is private tool.